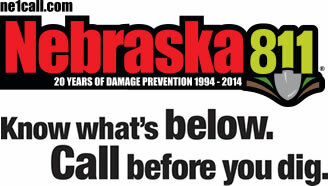 Nebraska City Utilities will check for gas leaks at anytime, day or night, at no charge to the customer. Our customers are urged to call as soon as they think they smell gas in or around their homes. Gas leak calls take preference over most anything else. Regardless of when the call comes in, night or day, we will get someone right on it. There is no charge for the call. Our customers’ safety is our number one concern. When an employee goes on a gas leak call, he checks everything over very carefully; the appliances and piping. He also probes the ground at the riser, and does not leave until he has found something, or is certain there is not a problem. If a problem is found, it will be isolated, or in some instances the gas may be shut off to the home, for safety reasons. The customer is then informed about the problem and advised to have the problem taken care of by a qualified technician.